The Atletico team-sheet raised eyebrows among fans and pundits alike as soon as the starting line-ups of both clubs were announced prior to the second leg – Jose Molina had made nine changes to the eleven which registered a memorable 3-2 win last Saturday. 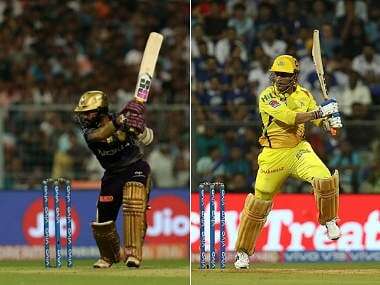 However, Molina’s strategy to bring drastic changes in personnel worked wonders as the visitors kept Mumbai City at bay. Having played an intense ninety minutes just two days back and with a possible final to look forward to, it would have been difficult for Atletico to sustain their standard of playing without some changes. Atletico’s previously documented squad depth, which had helped them navigate through injuries to key players at crucial junctures of the season, proved to be the difference between the two sides as Molina was able to field a team of equal quality, if not better, to that of Saturday. As Mumbai City ran ragged in the second half, the freshness in the likes of Javier Lara, Stephen Pearson and Pritam Kotal shone through in spite of Atletico playing with ten men for over fifty minutes. As the marquee player, Diego Forlan was not just a goalscorer or a goal creator for Mumbai City this season. An inspirational leader on and off the pitch, Forlan was absolutely indispensable to Mumbai City’s titular chances. Alexandre Guimaraes’ side had not won a single game in which Forlan did not feature – with five goals and three assists in twelve appearances, the Uruguayan was involved in over 40 percent of goals Mumbai City scored this season. Forlan’s creativity just outside the eighteen-yard box and his quality in the final third had helped Mumbai to their first-place finish, but the 37-year-old’s services were sorely missed by the home side on Tuesday. Guimaraes’ side registered only two out of their thirteen shots on target, both of which came in the first half of play. Sunil Chhetri, assuming the captain’s role in Forlan’s absence, flattered to deceive. 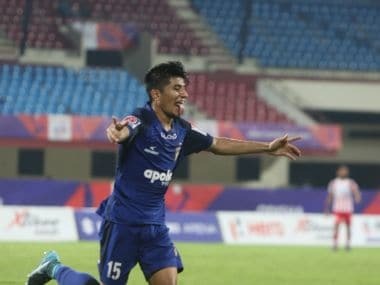 The Indian captain was through on goal in the sixth minute and fluffed Mumbai’s best chance of the night by tamely shooting at Debjit Majumder. While early signs indicated Mumbai City intended to use Sony Norde and Matias Defederico’s pace and movement on the wide channels to create chances, a frustrated home side eventually ended up punting long balls into the box and shooting from distance after they failed to break down the compact Atletico defence. Atletico’s penchant of avoiding losses served them well at the Mumbai Football Arena as Jose Molina’s side looked comfortable even when they were starved off possession. Although Robert was sent off late into the first half, the Atletico backline grew into the game as the match progressed. Defending in two banks of four with only Juan Belencoso upfront, once they were down to ten men, Atletico maintained their defensive line (Mumbai were flagged offside seven times) and kept it simple. None of the Atletico players attempted tackles in dangerous areas but they did not allow Mumbai City space within their defensive third either, keeping it extremely narrow and exploiting the lack of a genuine playmaker in the Mumbai squad. Except for Chhetri’s poor effort in the first half, Guimaraes’ side did not create much until Jackichand Singh came on just before the hour mark. The hosts had a few late chances through Lucian Goian’s forays into the midfield but had an underwhelming display going forward. For a side defending with ten men for the entire second half, the better chances of the game fell to Atletico. Javier Lara was instrumental in Atletico’s counter-attacks, acting as the focal point during the transitions. The Spaniard would have been rewarded for his brilliance with and without the ball, but Belencoso failed to get on the end of an incisive cross across the face of the goal while Pearson directed his volley off Lara’s free-kick just over the post. Atletico have showcased a thoroughly different aspect of their gameplay in the two knock-out matches so far and Jose Molina has a problem of abundance while selecting his starting eleven for the finals, for the likes of Hume, Postiga, Lara, Doutie, Ralte and Ruidas are in a rich vein of form. 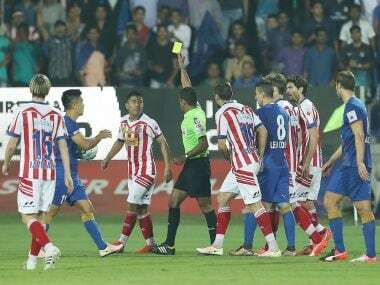 As has been the norm during the knock-out fixtures of the Indian Super League in the last two seasons, jarring scenes were witnessed right after the final whistle as players from both clubs clashed – with Juan Belencoso and Thiago Cunha seeing ‘straight reds’ for their involvement in the fracas. While Belencoso’s behaviour in light of his team’s impending final raises questions on his temperament, Thiago’s appalling actions warrant a stricter punishment. For a league which aims to raise the profile of the sport in the country, the Indian Super League must take a hard look at itself, analysing closely the ineptness of the referees in such a situation and the conduct of the clubs’ management and players – a bit of drama might add to the spectacle but frequent occurrences never set a good precedent.